Serena Williams of the United States achieved a rare Golden Slam by beating Maria Sharapova of Russia in straight sets, 6-0 6-1, to win gold in the women’s tennis singles. The 14-time grand slam winner only lost 17 games in the entire tournament. 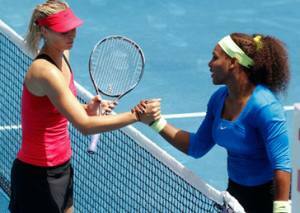 The 30-year-old American tennis sensation had won the last seven matches she played against Sharapova. She started the match with three aces and finished the match with two aces, affirming her tennis supremacy. Williams lost only five games in the three Olympic finals she has won, the 2000 Sydney doubles and 2008 Beijing doubles with sister Venus and the 2012 London singles. Sharapova entered the women's singles tennis final with a win over fellow Russian Maria Kirilenko, 6-2, 6-3 in the semi-finals. The 2012 French Open titlist faced the 2012 Wimbledon champion Williams, who prevailed with a 6-1 6-2 win over world number one Victoria Azarenka of Belarus during the semi-finals. Both Williams and Azarenka met during the semifinals of the Wimbledon 2012, where Azarenka put up a good fight, but in the Olympics, Williams won handily. Williams and become only the second woman after Steffi Graf to win all four grand slams and the Olympic title in their career. Serena started her Olympics campaign by defeating Jelena Jankovic (6–3, 6–1) in the opening match. Serena defeated Urszula Radwanska to reach the last 16 (6-2 6-3). She then defeated Vera Zvonareva (6-1 6-0) to advance to the quarterfinals. In the quarterfinals, she defeated Caroline Wozniacki (6-0 6-3), before crushing Azarenka in the semis then Sharapova in the final. Azarenka took the bronze medal by beating Kirilenko, 6-3 6-4 for the bronze medal. Serena is already considered one of the greatest players of all time with her 29 Grand Slam titles placing her ninth on the all-time list, including 14 women’ssingles, 13 women's doubles, and 2 mixed doubles. She is the most recent player, male or female, to have held all four Grand Slam singles titles simultaneously and only the fifth woman ever to do so. Williams ranks fourth in Grand Slam women's singles titles won during the open era, behind Steffi Graf (22 titles) and Chris Evert and Martina Navratilova (18 titles each). Among active players, male or female, she holds the most major titles in singles, doubles, and mixed doubles. She won her 13 Grand Slam doubles titles with her sister Venus and the pair is still unbeaten in final of Grand Slams. It was the first Olympics for Russian flag-bearer Sharapova as she missed Beijing in 2008 because of a shoulder injury. The women have already met on the Wimbledon courts, with the most memorable match played in the 2004 final, when Sharapova won her first Grand Slam title, aged 17.